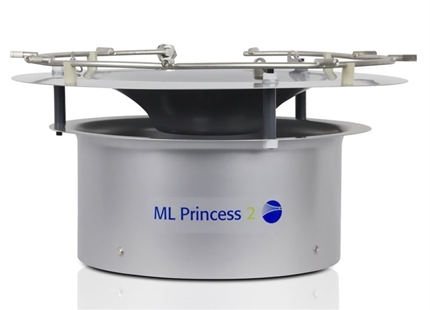 Pure water and high-pressure: MLP RO 500 (500kg/hr). 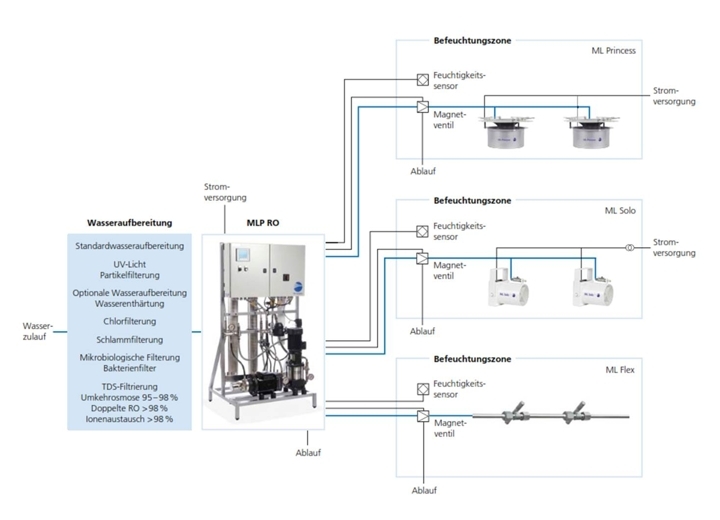 System schematic of the MLP RO system in combination with the ML humidifiers. 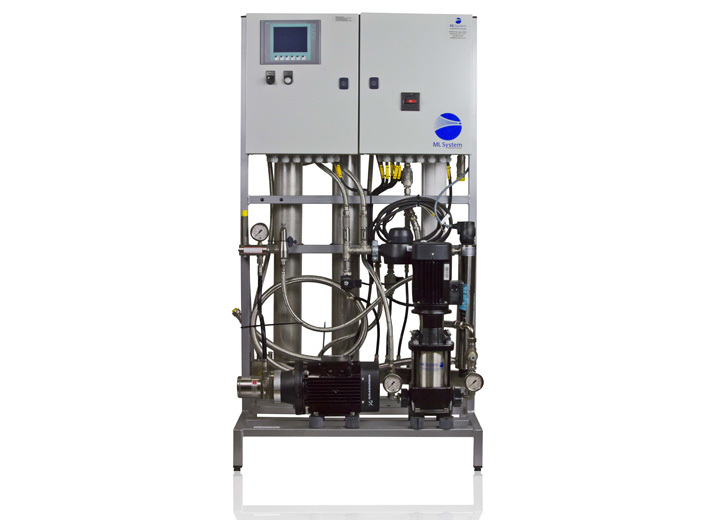 The MLP RO packages the required reverse osmosis unit and high-pressure pump into a single, space-saving system. It is compatible with all ML products. 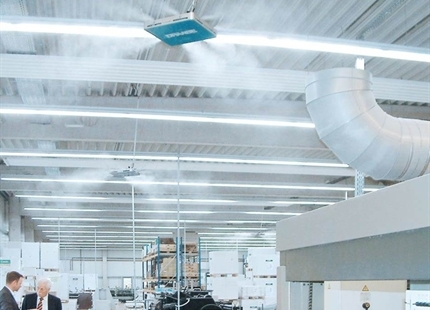 Modules in a range of separate sizes are integrated to match humidification volume – and even high-capacity systems require only a single installation footprint. Of course, the systems are available without reverse osmosis as well, if it should not be needed. The MLP RO is available in series production for 100 kg, 265 kg, 440 kg and 750 kg pure water per hour capacities. The individual modules are flexibly expandable and can be linked per customer specifications up to a total capacity of 10,000 kg/hour. High-pressure and quality - The high-pressure pump is manufactured from high-quality stainless steel. It works using water hydraulics and is therefore completely oil-free. 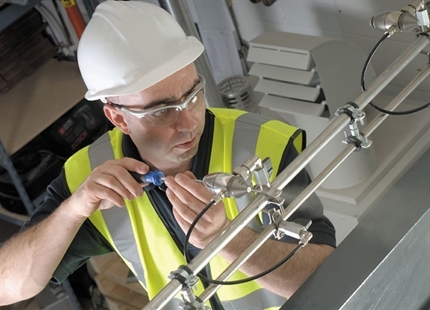 This saves on maintenance work and extends product lifetime. We guarantee 8,000 maintenance-free hours of operation for the high-pressure pumps in the first two years. Crystal clear water - The reverse osmosis unit fitted to the MLP RO removes minerals from the water supply, ensuring trouble-free and hygienic atomisation. The pores of the membranes used are so fine that they can filter out 95 - 98 % of all minerals and bacteria. Do you have questions about the MLP RO?